WELCOME to the first publication for people who share their lives with a physician – Physician Family Magazine, a publication created by and for medical families! A life in medicine is a journey. Having someone with whom to share that journey can make it SO much better – but it can be difficult to maintain loving connections while navigating the twists and turns of your Journey of Medicine. 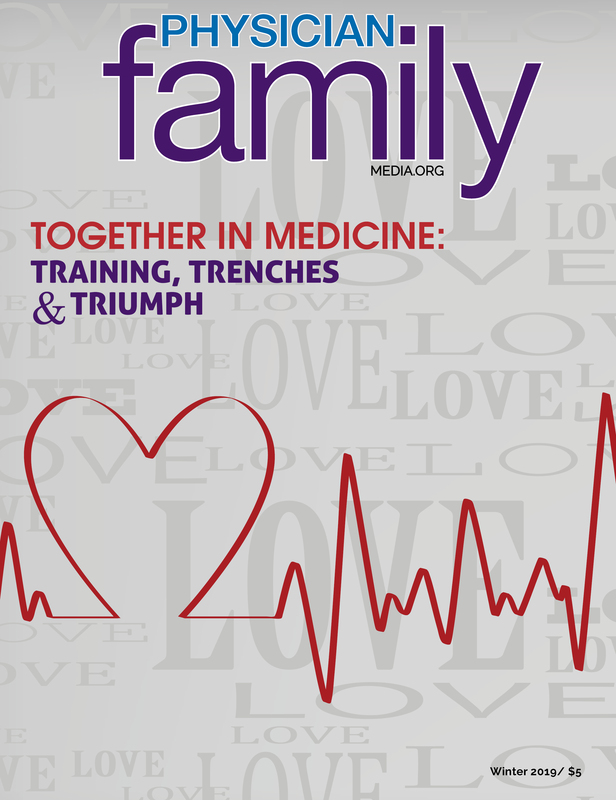 The Winter 2019 issue of Physician Family Magazine “Together in Medicine: Training, Trenches and Triumph” provides both professional advice and personal insight on how to preserve those all-important loving connections with our life partners - in spite of the demands medicine places on both of you. Each issue of Physician Family features focuses on issues and challenges faced by medical families, with special emphasis on the four stages of medical life – medical school, residency and fellowship, active practice and retirement. Here at Physician Family, we “get it.” Read each new quarterly issue as it goes live here, and check out our weekly blog every Wednesday. Make sure to Like our Facebook page – it’s the first place we post new content! Physician Family is published by the American Medical Association Alliance, the nation’s largest network of physician families, uniting and empowering physician families since 1922. You can read this valuable “go-to” guide for medical families, online anywhere, any time – FREE! AMA Alliance members receive hard copies of Physician Family in the mail as a member benefit! Joining is easy. You and your physician family are invited to join our new closed Facebook group Physician Family COMMUNITY - just for you! Check it out here! Please feel free to contact us with ideas, insights, comments or suggestions. And, please, tell your family and friends that Physician Family is here for them, too!